Grab and share this slideshow on your website. Just copy and paste the code above. With a population of approximately 20 million, Mumbai is known for its stark social and economic divides. Informal settlements occupy about 10 percent of the city’s land mass but house close to 60 percent of its population. While some of these informal settlements, like Dharavi, have evolved into thriving mixed-use districts, many can be described as slums per UN-HABITAT’s definition: areas characterized by overcrowding, inadequate access to water, sanitation, poor quality in housing, and insecure residential status. The governing processes applied elsewhere in the city cannot serve the needs of these areas, or recognize the potential of empowering a population who have collectively produced and maintained neighborhoods in the absence of any institutional support. 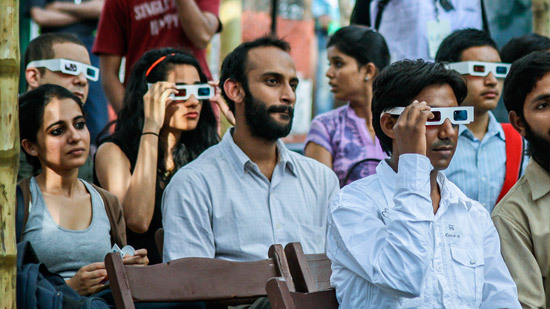 Meet in the Middle was a program series conceived by the Lab to examine the development gaps in the city and to explore how public, private and civic bodies can work together to bridge them. A set of ten three-hour discussion-based workshops held at the Lab identified and debated city issues, and celebrated examples of collaboration that could inspire a more holistic and inclusive development model. Meet in the Middle was structured as a platform for city stakeholders from top-down planning, informal grassroots organizations, and everything in between, to discuss how the city’s institutional, informal and market-driven forces could work together to tackle some of Mumbai’s greatest challenges. 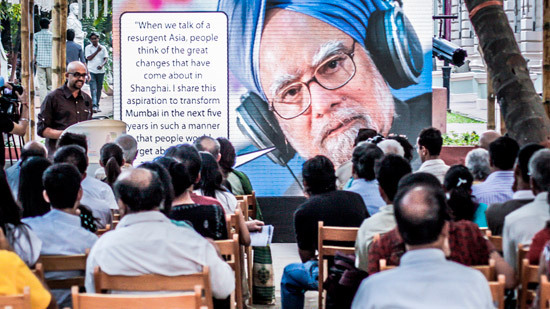 Each of the ten workshops discussed one specific urban issue in Mumbai. The issues covered included water, public spaces, transportation, housing, infrastructure, investment, and planning. Seven or eight speakers from diverse disciplines and sectors—academic, public, private, and nonprofit—participated in every panel, and panelists included grassroots activists, architects, corporate leaders, economists, environmentalists, micro-financers, sociologists, transport planners, urbanists, and government officials, among others. The starting point of every discussion was a provocative body of research and imagery created by Lab Team member and architect Neville Mars that highlighted the infrastructural and institutional gaps between the “formal” and “informal” city. This was followed by individual responses to an open-ended question framed to elicit insights specific to the speaker’s expertise. In this way, the stage was set for cross-learning in the subsequent discussion. The goal was to spark conversations among the panelists and the audience on unique ways to visualize and strategically tackle problems the city faces. A common theme that emerged from the discussions was that, for all urban issues, those looking for solutions must grapple with the diversity of conditions across the city by addressing the problem at different scales. For example, transit problems need a range of interconnected solutions that operate from metropolitan scale to the pedestrian scale. With regard to informal settlements, a catalog of processes and tools has to be developed for a gradient of conditions. Settlements that are struggling in the absence of basic infrastructures are more vulnerable and need support from NGOs or citizen organizations to leverage institutions. On the other hand, older settlements that have had the ability to develop on their own terms have a robust ecology of social and economic networks that provides a fertile ground for new forms of collaboration. Meet in the Middle heard from practitioners who engaged within this range of contexts. 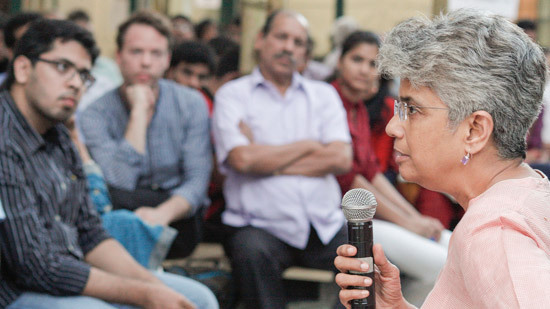 Anita Patil-Deshmukh from Partners for Urban Knowledge and Research (PUKAR) presented a community-based participatory research model led by “barefoot researchers”—young people from Kaula Baunder, a slum severely lacking access to basic amenities. The researchers went into their community to gather data and raise awareness for preventative healthcare. By mobilizing the community, PUKAR helped the slum lobby for a municipality-funded vaccination and medication drive that dramatically improved health conditions. Architect Prasanna Desai from Pune demonstrated how, in a similar settlement, his team of architects incrementally transformed a neighborhood of mud houses into three-story concrete homes. By engaging the community in the design process and mobilizing support around an idea, Desai convinced a local politician to channel federal funds into his in-situ rehabilitation project. Alexis de Ducla presented his observations from more developed settlements like Shivaji Nagar and Bhandup, which like Dharavi, have developed ingenious informal networks to fill service and infrastructural gaps through local entrepreneurs and contractors. De Ducla has been closely following how a contractor in Shivaji Nagar is able to raise a three-story walk-up apartment within between twenty-eight and forty days for the price of around Rs. 600,000 (USD $11,000). Working for Lafarge, a cement company, De Ducla is figuring out how to deliver their products to the most prolific network of affordable housing builders. He has found that these local contractors have more quality control than is exercised in the construction of the high-rise rehabilitation towers built by the government to house the urban poor. Quality in the informal settlements is ensured because the contractor’s career depends on the trust of the community. While the series celebrated successes and possibilities, it is worth noting how brutally uneven Mumbai’s political grounds are. Mumbai suffers from a level of state corruption that compromises the legal norms and regulations upon which the formal city is built. Audience members at the Lab regularly brought up examples of well-intentioned public-private partnerships compromised by blatant corruption. To devise successful public-private-civic collaborations within this context requires extensive conversations and active civic participation. The city needs platforms that can demonstrate the successes of multi-disciplinary collaborations not merely through presentations and discussions but through pilot projects. Meet in the Middle was an important first step in creating this much-needed platform and there are many lessons to be learned from the Lab’s experience that will be valuable in creating a more permanent platform for establishing long-term effects on city planning and policy. The goal for such a long-term platform should be to produce successful site-specific prototypes that can influence policy-makers to see the potential of small but effective public, private, and civic bodies. Decentralized public platforms that meaningfully question existing models of development by exploring new collaborative forms have the potential to empower the most important stakeholders of the city—the citizens. By placing these discussions at the heart of the informal city, the city’s dividing lines can become a common ground for public, private, and civic bodies to imagine a more inclusive and resilient Mumbai.